Born in Bangkok in 1946, he attended school there at St. Gabriel's College and Triam Udom School. From 1963-1973, under scholarship from the Bank of Thailand, Dr. Supachai received his Master's Degree in Econometrics, Development Planning and his Ph.D. in Economic Planning and Development at the Netherlands School of Economics (now known as Erasmus University) in Rotterdam. In 1973, Dr Supachai completed his doctoral dissertation on Human Resource Planning and Development under supervision of Professor Jan Tinbergen — the first Nobel laureate in economics. His dissertation was subsequently published under the title Educational Planning and Growth in Developing Countries by Rotterdam Press and widely used by universities in Europe. That same year, was accepted as a visiting Fellow at Cambridge University and conducted research on development models. Dr. Supachai began his professional career at the Bank of Thailand in 1974, working initially in the Research Department. Later, he moved to other divisions, including the International Finance Division and the Financial Institutions Supervision Department. During his tenure at the BOT, which lasted until 1986, his expertise in economics and financial matters was widely recognized. Dr. Supachai acted as spokesman for the BOT for a brief period. He was a principal figure in devising measures to bail out troubled financial institutions in the early 1980s and was instrumental in the BOT's tight control on the public sector's external borrowings as well as the passage of legislation aimed at abolishing non-formal and illegal financial institutions in the system. In 1986, Dr. Supachai relinquished his post as the Director of the Financial Institutions Supervision Department to run for Parliament. With his notable track record at the BOT and his successful campaign, he was appointed Deputy Minister of Finance. During his first political term, he introduced the value-added tax system, laid the foundation for the establishment of the country's Export-Import Bank and improved channels for the utilization of state enterprises' funds for the government. He also helped devise strong fiscal disciplines which subsequently led to a continuing series of budget surpluses, thus enabling Thailand to achieve a high economic growth rate for many years. After dissolution of Parliament in 1988, Dr. Supachai was appointed Director and Advisor, and subsequently President, of the Thai Military Bank. As bank president, he vigorously promoted its overseas expansion. His involvement in the business sector deepened through his chairmanship of several corporations. At the same time, he maintained his contacts in academic circles through contributions to a number of universities. In 1992, he was appointed Senator and led a sub-committee to draw up Thailand's Seventh National Economic and Social Development Plan (1992-1996). Returning to politics in 1992, Dr. Supachai became Deputy Prime Minister entrusted with oversight of the country's economic and trade policy making. He supervised key economic offices, including the Budget Bureau, the National Economic and Social Development Board, the Ministry of Commerce, the Ministry of Industry, and the Ministry of Agriculture and Cooperatives. In the process, he set policy directives on macro-economic management for the country. He held the position of Deputy Prime Minister until 1995. As Deputy Prime Minister, he was actively involved in international trade policy. A staunch supporter of free and fair trade, Dr. Supachai played a pivotal role in the international arena, principally in the Asia Pacific Economic Cooperation (APEC) and in the Association of Southeast Asian Nations (ASEAN). He also promoted efforts to liberalise trade in the region through what has become the ASEAN Free Trade Area (AFTA). His active participation in ASEAN regional activities helped forge closer relationships between member countries and enhanced their position as a unified economic grouping with a strong voice in international negotiations. As chairman of Thailand's International Economic Policy Committee, Dr. Supachai was highly influential in charting the country's international trade and economic policies. In 1993, he convinced the public and the private sectors on the need for Thailand to accept the Uruguay Round package and consequently helped steer its ratification through Parliament. Dr. Supachai represented Thailand at the signing ceremony of the Uruguay Round Agreement in Marrakesh and he has ensured his government's full and faithful implementation of its obligations under the World Trade Organization (WTO). On the wider regional and inter-regional stage, Dr. Supachai has played instrumental roles as initiator and active supporter of numerous trade and investment facilitating fora, groupings and development projects. He was also instrumental in the conceptualization of the New Zealand government private sector-sponsored Asia 2000 Foundation, of which he is Honorary Advisor. Dr. Supachai has made significant contributions to the Emerging Asia Project of the Asian Development Bank (ADB) in commemorating the Bank's 30th anniversary and he has been named to the project's Advisory Board. Dr. Supachai was the first to push for the formation of the Asia Europe Meeting (ASEM) that draws together heads of governments from Asia and Europe to foster closer ties between the nations of the two continents. He first proposed the formation of ASEM at the East Asia Economic Forum in Singapore in 1992. He has been a major driving force behind the Greater Mehong Sub-region from its inception, pushing for closer economic integration between the economies of Yunnan China, Laos, Thailand, Cambodia, Myanmar and Vietnam. He was also the initiator in the BIMST-EC consultative group that links countries in South and Southeast Asia, namely Bangladesh; India, Myanmar, Sri Lanka, and Thailand. His contributions to the grouping are well recognized. He was co-founder of the ASEAN-Japan working group on Indochina and Myanmar, along with former Prime Minister Ryotaro Hashimoto of Japan. Following the change of government in November 1997 in the wake of Thailand's financial crisis, Dr. Supachai was appointed Deputy Prime Minister in charge of economic policies, and Minister of Commerce. In his capacity as Minister of Commerce, Dr. Supachai relaxed Thailand's restrictions on foreign participation and ownership and thoroughly revised the Alien Business Law. He brought the country's accounting standards into line with international practices to enhance and ensure transparency in the economic system. 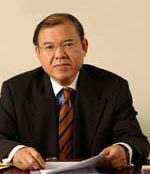 In 2000, Dr. Supachai was awarded the Nikkei Asia Prize (Regional Growth). In 2001, he was appointed Visiting Professor of the International Institute for Management Development in Lausanne. He has published a number of books including Globalization and Trade in the New Millenium (2001) and China and the WTO: Changing China Changing World Trade (2002, co-authored with Mark Clifford). Dr. Supachai is the Chairman of the Board of Governors of Yonok College in Lampang, Thailand where he serves as chairman for thirteen years. In September 1999, he was elected Director General of World Trade Organization (WTO) taking office on 1 September 2002. Dr. Supachai is married to Mrs. Sasai and has a son and a daughter.